Expression error: Missing operand for or. This user is a proud owner of a PlayStation 3. This user uses a Windows XP computer. This user enjoys playing Computer Games. 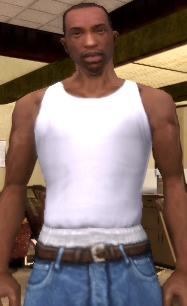 Zach Marsh (born May 29th, 1995), primarly known on GTW as Carl "CJ" Johnson is a user on Grand Theft Wiki, whose username is taken from the protagonist of Grand Theft Auto: San Andreas. He is mainly known for his short-lived series Grand Theft Auto: The Untold Stories, which premiered in 2006 and was cancelled after a lengthy hiatus in 2011. Marsh was born on May 29th, 1995 in Scarborough, Ontario, Canada. He grew up in Etobicoke and currently lives in Ajax. Marsh's primary focus is on music, as his goal is to make it famous as a drummer for an influential rock band a la Led Zeppelin. Some of his idols are John Bonham, Buddy Rich, Gene Krupa, Mike Portnoy, Dennis Wilson, Stewart Copeland, Bernard Purdie, Jeff Porcaro, and Neil Peart. He is a fan of classic rock, jazz, and metal music. Some of his favourite bands are Led Zeppelin, Queen, The Beach Boys, Dream Theater, Green Day, and The Beatles. Marsh was exposed to GTA at the age of seven and has been a fan of the series ever since. His favourite game in the series is Grand Theft Auto: San Andreas. Marsh has been a member of many different Grand Theft Auto communities - the series is his favourite video game series ever made, and he posesses a wide knowledge of every game and most major characters, events, and locations in the games. He has at some point owned and played every Grand Theft Auto game released, including London, 1969 and the lesser-known London, 1961, and is an owner of the rare GTA Advance. Marsh is an avid writer, and at the age of 11 premiered the first episode of his fan fiction series Grand Theft Auto: The Untold Stories. At first, the series only reached a very small audience, but was critically acclaimed. However, the series only lasted three subsequent episodes before going on a 5-year hiatus, in the wake of scathingly negative reviews. Marsh cancelled the series on July 17th, 2011. Marsh also made several smaller GTA series, including the disastrous Daily Dude Damage, which was killed before it ever really got started. Marsh has not denied the possibility of the series' resurgence, and he has started to outline a specific plot for himself in the event that he does start writing the series again. The only details released by him are that, if the series is rebooted, it will involve a story chronicling the life of Carl Johnson's father, a character invented by Marsh named Brian Greaves, who later changes his last name to Johnson, and is the namesake of the youngest sibling of the Johnson family. Marsh has referred to him as a "brilliant" character, stating that he has "never come up with a character as detailed and as developed as he is. Any fans of the GTA series will fall in love with his story." This page was last modified on 13 August 2012, at 23:05.